Terms and Conditions for One for the Road Used Cars Auction Please read these terms and conditions very carefully. If you disagree with any portion of these terms and conditions, please do not bid! Reading and understanding these terms and conditions is the Buyer’s responsibility. If you have any questions you may contact Southern Auction Solutions here after called “auction company”. Office 256-357-9600 Ron@SouthernAuctionSolutions.com *** DISCLOSURE***One for the Road Used Cars is a licensed Used Motor Vehicle Dealer. Southern Auction Solutions is an agent of One for the Road Used Cars and only represents the Dealer. Southern Auction Solutions has been contracted to liquidate the vehicle holdings of One for the Road Used Cars. Southern Auction Solutions is not the Seller of these vehicles. Your Bill of Sale and Ownership documents will be transferred by One for the Road Used Cars. 1. Bidder Contract-This BIDDER CONTRACT entered into between the Bidder whose name is signed below and Southern Auction Solutions. Bidder agrees that the terms listed below shall govern this auction and he/she agrees with them. Additional terms may be posted or announced from the auction block which are just as binding as the below terms. Obtaining a bidder number indicates acceptance of the terms and conditions of the sale. If you do not agree with all of the terms and conditions of the sale, please do not bid. All items are sold “As Is”, “Where Is,” and all sales are final. Neither auction company nor Seller make any guarantees whatsoever concerning the items to be sold. It is solely up to the bidder to inspect and examine the items to be sold, and to ask any questions if necessary. Buyer should be satisfied as to the condition of the items to be sold prior to bidding. 2. “As is”, “Where is” NO WARRANTY. All items are sold “As Is”, “Where Is,” without guarantee of any kind. The descriptions of items appearing in advertising prior to this auction are believed to be correct. Nevertheless, neither those descriptions nor any oral statements made by the Owner (or his agents or officers) or the auction company (or their agents or officers) concerning any item shall be construed as a warranty, either expressed or implied. I, the Bidder, have examined this merchandise and accept it the way it is. Most of the vehicles have been running, but are not guaranteed to run or drive the day of the sale. Some vehicles are not operational. We have disclosed all that we are aware of about each vehicle; however it is the Buyer’s responsibility to inspect the vehicle prior to placing a bid. 3. Proof of Ownership-Proof of ownership for each vehicle is posted on our web site. It is the Buyer’s responsibility to verify the copy of the title matches the vehicle they are purchasing, and that you are satisfied with the type of ownership that you will be transferred. 4. Buyers Premium-There will be a 10% Buyers Premium added to your high bid price. Example – If you bid $1,000.00 on a vehicle you would pay $100.00 Buyers premium and total purchase price will be $1,100.00 ($1,000.00 x10% = $100.00 + $1,000.00 = $1,100.00) See Credit Card Convenient Fee in 8. Full Payment 5. Sales Tax-There will be a 2.75% sales tax added to your purchase price. This is calculated after the Buyer’s Premium and is added to the high bid amount. Example high bid = $1,000.00 x 10% Buyers premium = $1,100.00 Purchase price X 2.75% = $27.50 totaling $1,127.50. 6. Transfer Fee-There will be a $25.00 transfer fee charged to each vehicle. 7. Inspections and Equipment Needed-Southern Auction Solutions will be present inspection day, Friday February 15, 2019 from 9am -4pm Central Standard Time and the morning of the auction from 8am until the start of the live auction. We will NOT have staff or equipment to jump off vehicles. Some vehicles may not crank because of weak batteries. We suggest you bring your own equipment and mechanic to inspect the vehicle for you. We will be present to answer any questions about the auction process and to pre-register bidders. TEST DRIVES will NOT be allowed. Our insurance does not allow for test drives. You will be allowed to crank the vehicle move it in the parking lot but not leave the property. If you cause damage to a vehicle, you will be responsible for the damages. 8. Full Payment-No vehicle may be removed until it is paid for. Payment for purchases must be made by cash, cashier’s check, or credit/debt card (Credit/debit Card will have 3% upcharge). All sales are subject to state tax laws. NO Financing is available!! Possession of the vehicle and ownership documents will not be transferred until payment has been received and verified by the auction company. If you do not have the means to pay for the vehicle please do not bid! Cashier’s checks must be delivered to Southern Auction Solutions 23 Main St. Wedowee, Al 36278 before you may pick up your purchase. Dead line for payment delivery is Tuesday February 19, 2019 at 5 pm. Payments not received by Tuesday February 19, 2019 at 5 pm cst. will be assumed as a breach of contract and legal avenues pursued. Pick up will is discussed in item 14 below. 9. Type Auction – This is a simulcast live auction with internet pre-bidding and out bidding platforms. Online bidders and live auction crowd will be bidding against each other. 10. Online Purchasers- Have until Tuesday February 19, 2019 at 5 Pm to deliver payment for their purchase. This payment must be in the form of certified funds or paid by credit card the day of the auction. You may not pick up your vehicle until your payment has been received. Your ownership documents will not be issued until payment funds have been verified. Payment should be sent or delivered to Southern Auction Solutions, 23 Main St, Wedowee, Al 36278. No other location for payment will be available. 11. Bill of Sale-You will be provided a Bill of Sale the day of the auction if paying in cash. If paying by Cashier’s check or credit card your ownership documents will be mailed to you once these funds are deposited into auction company’s account. 12. The Issuing of Title - One for the Road Used Cars will sign the title over to the buyer the day of the auction, if buyer is paying cash. If paying with Cashier’s check or Credit/debit card the buyer will receive the title by mail once the funds have been verified. There will be a $25.00 transfer fee added to your final price. 13. Tax Except-Dealers that are tax except must bring proof of their exception to present to the Auction Staff. We must have this documentation on file in the event of an audit. If you fail to present proof of your exception you will be required to pay sales tax the day of the auction. 14. Pick up- You will be given the keys and ownership documents after you have paid for the vehicle, if paying in cash. If paying by Cashier’s check or credit/debit card you will not receive the keys or ownership documents until the funds have been verified. You may pick up your vehicle the day of the auction or after your funds have been verified until 5 Pm Auction day, Sunday from 8am – 5pm, Monday 8am- 5pm, Tuesday 8am – 5pm, Wednesday 8am- 5pm. After that, you must contact the staff of One for the Road Used Cars and arrange an appointment to pick up your vehicle. The staff of One for the Road Used Cars will require a 24-hour advance notification in scheduling your pick up. 15. Storage-Storage will be in the amount of $15.00 per day and will be charged by One for the Road Used Cars after February 22, 2019. Southern Auction Solutions nor One for the Road Used Cars or its owners or employees are responsible for any damage to any vehicle. 16. Abandonment- After March 16th any vehicle not picked up will be considered abandoned and will be property the property of One for the Road Used Cars. 17. Disputes-The Auctioneers shall designate the winning bidder after each item is auctioned. If a dispute arises between two or more bidders, the Auctioneers reserve the right to reopen the bidding. The Auctioneers’ designation of a Buyer shall be final. 18. Buyer’s Responsibility-After a bidder has won the bid with his/her high bid, he/she may have become the new owner of that item, even though he/she may not have paid for the item yet. The item(s) becomes the full and sole responsibility of the Buyer at this point, and Buyer assumes all risk of loss and damage. Buyers should guard their items accordingly. 19. Injury and Damage-Bidder acknowledges responsibility for any personal injury or property damage caused by Bidder or his agent, and further agrees to hold Southern Auction Solutions and its employees and agents and One for the Road Used Cars and its employees and agents harmless from any personal injury to himself or his agents, and any property damage incurred on auction premises. 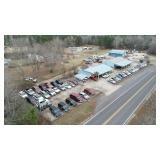 Large Liquidation Auction of used cars and trucks.